It’s ironic. 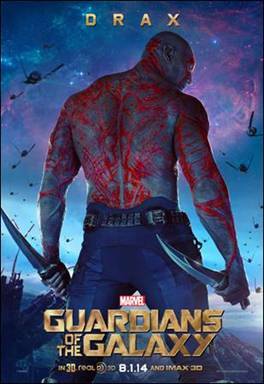 I actually had never heard of the world famous Dave Bautista until I saw that he was in the Guardians of the Galaxy movie. Maybe I had been hiding under a WWE “rock,” but Batista was never a part of my vocabulary. But after sitting in a room with a 6 foot 6 inch man with an arm bigger than both of my thighs put together, I was drawn to this particular interview not for his WWE history, but his genuine sincerity. Bautista is so much more than a strength powerhouse. In my opinion, this 6 time world wrestling champion was perfectly casted for the complex Drax the Destroyer. Check out what drew him to the role, how acting compares to the WWE and what’s next for Dave Bautista. I’m not going to lie. Sitting only a few feet away from a man that instantly crush my skull was very intimidating. Listening to Dave Bautista speak however was a different story. He was nervous. He was new to the spotlight. He was humble. He was genuine. I couldn’t have been more intrigued as our interview unfolded as we learned more about the man behind the mysterious Drax. What attracted you to the role of Drax? (With no hesitation) Oh, it’s easy. It was because he’s a nut job. It’s because I’ve been wanting to do a role that wasn’t kind of one noted. You know, it’s kinda multi-layered, so [he’s] a character with a little bit of an emotional range. It’s something that I needed for my career really bad because I think people have a certain perception of me leaving wrestling that they just saw me as THAT guy, and I’m really not that guy at all. What’s it like taking on the role of an iconic hero? Were you a fan growing up? I had no idea who they were before I got this role. I had absolutely no idea, which I think this is gonna be- which they’ve been aware it’s gonna be a challenge right off the bat because it’s not one of your mainstream comics. But as far as it being a more… it’s just really starting to hit me how big it really is. When we started doing press last week, and we went over to Singapore. And when hundreds and hundreds of people show up, not only to talk to you, but to see YOU, and they’re already in support of this film which hasn’t come out. They’re just so excited about it. And it’s pretty overwhelming, yeah. Did you have any heroes growing up? [LAUGHS] So I always feel guilty when I’m asked this question because, yeah, I’m a Marvel guy, but Batman was my guy. I have the whole Dark Knight series When I was a very young kid, for some reason, Aquaman was my favorite. So I always feel bad answering, but that’s the honest answer. 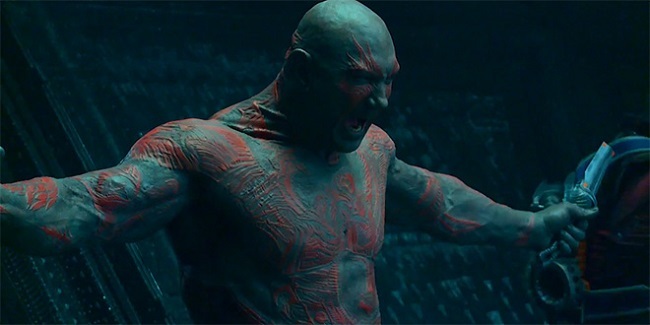 How did this role as Drax compare with your expectations on what it would be like? You know, it’s weird. I really didn’t have any expectations. It’s just kinda starting to hit me how big it actually is. I knew that the role would change my career and change my life. I mean, really pounding the pavement for years since I left wrestling. It was hard for me to leave wrestling because that was my bread and butter. I mean, and that’s how I made a career; how I made a living for ten years. And it was scary leaving it behind, you know, taking a chance on myself because I didn’t have offers coming out of wrestling. I just left it to pursue acting. I don’t think I knew what to expect. I was just of hoping for the best. Did you have to audition? How did it go? I had to audition- I think it was the first two initial auditions, but I think I went back for maybe another audition; maybe another two auditions. And then I think two or three screen tests and makeup tests. It was a lengthy process. I mean, it was just like over about three and a half to four months. And then even when I got the part, I think it was another month or so before I could even acknowledge to anyone, publicly, that I got the part. I couldn’t believe how quickly Bautista answered this next question…and how shocking the answer was. How much did your WWE training help prepare you for this movie? None, none at all. It’s weird because it’s so different. I guess being athletic helped me a little bit. I picked up on stuff kinda easy. It’s just so different from anything that I’d ever done. We had really good stunt guys and kinda relied on them for their advice, and they showed me how to do stuff, and I would do it, I’d mess it up and they’d say, well, try it this way if it’s easier. And I’d say no, I like the way you did it because it looks cool that way. So just show me how to do it that way.. Were you in makeup for hours at a time? Yeah, it typically took about four hours to apply and about an hour and a half to take off. But it varied. When we first started, it was longer to put it on; longer to take it off. But toward the end of the film, it was about three hours, actually, to put on- an hour to take off. (Hyperventilating as I ask my question) Did makeup limit your movements at all? Yeah, it did a little bit. Yeah, because there was all the prosthetics. They were all glued on, you know, so it did limit me a little bit, but not tremendously. I mean, considering, you know, the visual and the makeup. 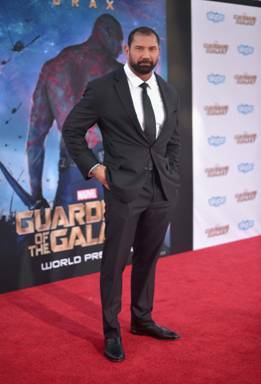 So what’s next for Dave Bautista in the acting world? So many perceive him as the “action” guy. Is that all we should expect? For me, I’m going to do a remake of Kickboxer. So I’ll be an updated Tong Po. Right now as far as career wise, that’s all I have. I never set out to be an action star, and I think most people think that I’ll lean that way because of my background in wrestling, and because of the way I look. But actually, I wanna pursue more dialog driven stuff; more storyline driven stuff; character driven stuff. Like, I’m a huge fan of Tarantino’s stuff and Guy Richie stuff, and Martin Scorsese; those are the type of films I love and would like to be involved in. As far as action, I don’t think it’s gonna ever get any bigger or better than this. I just, I just don’t. You know, it’s marvelous. You’ve got such a winning formula. So I’m getting my action fix and then some. But I really wanna do more dialog driven stuff, just character acting, you know? And what about the wrestling world? Is it goodbye for Batista? No, don’t rule that out. I would love to fight again. I definitely wanna go back and do some wrestling again. If you could do anything for the rest of your career, what would it be and why? Wait, did he just say theater???? That’s a really hard toss up, because I really love professional wrestling. I love it. I always tell people my favorite stuff is not the stuff that’s televised. I like doing the stuff that’s untelevised because we’re not time restricted, and there’s more time for us to interact with the fans. But I love that immediate feedback and I wouldn’t mind actually doing theater if I could find something I could do. But doing the film stuff, it’s just so challenging, but it’s hard to just wait, and then wait and wait. This has been the longest ten months of my life just waiting for this film to come out to see it, because I’ve been so excited about it. (Wow, I just saw the little kid in him!) It’s kind of cool. I’m forty-five. I found something that’s very challenging and I’m passionate about. I always feel like it kind of keeps me young. What do you hope audiences take away from your character as Drax? I think when people see Drax, they automatically think that he’s gonna be a kind of one-noted character, who is the type of character that all he’s good for is fighting and chopping people’s heads off and stuff like that. The way I approached the character was never really looking at Drax as a warrior, but more as a father and a husband. I hope that people will see that that’s basically who he is and all his rage just comes from heartbreak, and not so much because he’s just h*ll bent on cutting people’s heads off, you know? He’s really just heartbroken over the loss of his family. 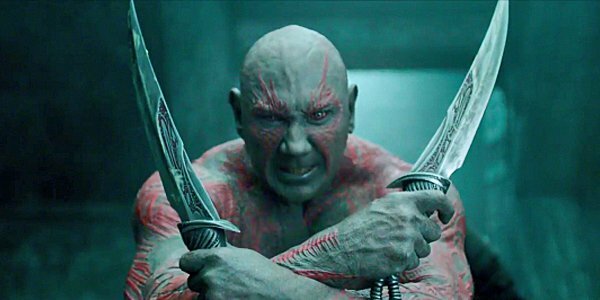 Dave Bautista…a little mystery, a little history and a lot of Drax make up one of the most intriguing characters of the Guardians of the Galaxy! Make sure you take the time to really get to know the emotion behind the Destroyer. I certainly did…and Drax is now definitely one of my favorite characters! 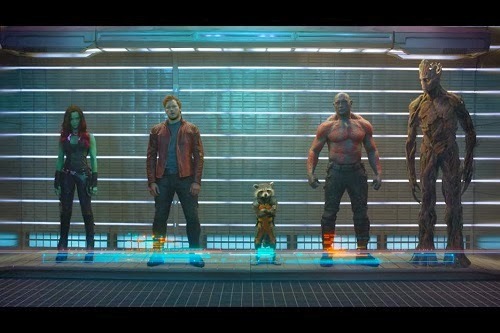 Guardians of the Galaxy is in theaters everywhere right now! Be sure to check out the historic Marvel film this summer! Missed my epic Guardians Interviews? Now is the time to catch up! Disclosure ~ I received a once in a lifetime free trip as media from Disney. While the amazing trip was free, my wild excitement is genuine and all opinions are 100% my own. Be sure to follow Saving Said Simply via Facebook, Twitter, Google, Instagram, Pinterest and YouTube for more reviews, giveaways and more. Ok- I have am forcing my hubby into going this weekend. You would think that it would be the other way around, right? It’s true that once an makeup artist knows your body, the process goes A LOT faster. I experience this a lot in the theatre. I’m so proud that they used makeup and not CGI for this! I miss the days of puppetry and makeup! I am not a fan of the superhero movies but my son and his dad went on yesterday to see it. My son loved it and I will let him read this interview because that was one of his fav characters. I’ve never heard of Dave Bautista. Loved your makeup question, though. So much goes into that process! I am looking forward to seeing this movie it looks so good. I love how humble he was. When I go see it, I’m going to remember this article as I see him onscreen. I can’t wait to see gaurdians of the galaxy. It had an amazing first couple days! I have never heard of Dave Bautista either. I really want to see this movie – it looks so good! Will be great to see. Looks really good. It’s really interesting to read Dave’s responses. He’s right, I had the perception that he WAS Bautista, but really he’s just a guy that played a role. He was very good at selling his persona as a wrestler, so I’m sure he did a great job in Guardians of the Galaxy. Looking forward to the release of the movie. I will not be able to see it in theaters which is a bummer! How exciting for you to get interview Mr. Bautista. My family will be making a trip to the theater to watch Guardians of the Galaxy. It looks like a action adventure with a few comedic moments. I am a huge fan of Batista. Of course, I used to watch a lot of wrestling. I can’t wait to see this movie. We’re going this weekend for Hub’s birthday. It was his humility that got me. And that he put us on his FB page! Interviewing movie stars is one thing, but when they are so friendly and warm, it is a pleasure to do what we do! Thanks for sharing the interview. I can’t wait to see the movie. Hopefully next weekend. He sounds like a very intriguing character and person! Okay…I just have to say. That’s one gorgeous man! I am definitely going to check this movie out. 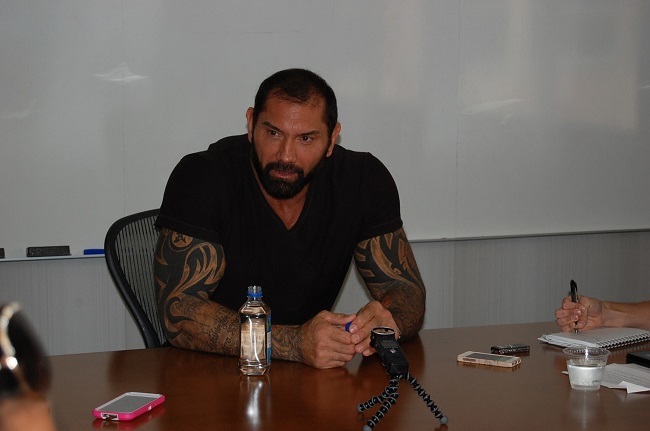 I definitely would have been intimidated sitting near Dave Bautista, that’s for sure! It’s so funny that he was nervous! I love reading interviews. 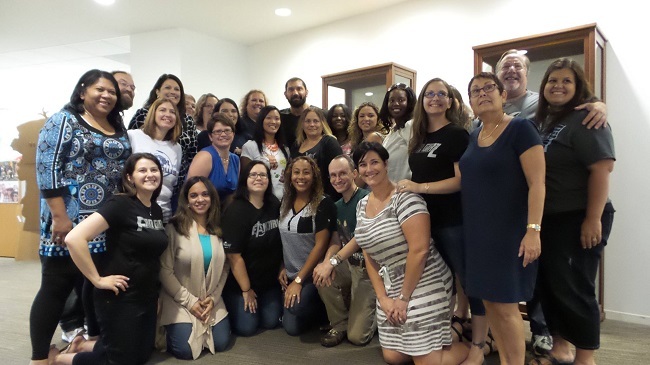 Thanks so much for sharing – it had to be an amazing experience! As soon as I get a free space in my busy week, I have big plans to go see this! I have heard that it is amazing! And I love Chris Pratt! I have to admit, I had not hear of him either. We must have been under the same rock! He was perfect for the role of Drax! Ohh, this movie seems awesome. I’ve never heard of him either. I am super distracted because he is so good looking. I have been hearing good things about the movie! What an incredible opportunity! I hadn’t ever heard of him either. My son went with his father to see the movie and loved it! BTW, I recognize some of my blogger friends in that picture! Maybe one day I’ll get to go on one of those trips! I’ve been seeing his picture around on Facebook and Twitter, and wondered who he was. Very cool! I doubt my girls will be watching this movie, but it looks like it’s a great film. SO much buzz and a lot of posts. What a fun experience, I can honestly say that with all the exposure this is getting in the blog world – I really want to watch it. Whereas before I barely heard about it and was like “eh, maybe I will watch it” .. now you all have sold it to me! What a great interview! Sounds like such an exciting opportunity for you. Rock on! I’ve enjoyed reading about this trip. My friend actually got to meet him at a wrestling event. That looks like it is going to be a great movie. I can’t wait to see it. Oh my gosh, I LOVE Bautista! We watch WWE a lot and I’ve loved him since I was in middle school haha ! I can not wait to see this movie! My kids and hubby are going to love it. Fun event! Looks like you had a blast! Great interview! I’ve been hearing great things about this movie! OK, so I hadn’t heard of him either, but man is he handsome! I kinda want to see the movie now, although it looks like the make-up artist did a pretty good job making him not look like, well, him. He sounds like a very interesting man! Can’t wait to see how well he plays his character in this movie! It sounds like such a great movie. I have read a couple interviews and the cast sounds like they really enjoyed being a part of movie. Too funny that he was drawn to the character because he was a nut job. I love his humility, too. This movie looks great!! I so want to see it! I’ve seen commercials for this movie several but don’t remember seeing this character. It looks like it might be interesting, but we rarely make it to theater showings. I’ve seen a lot of advertisements for this movie. It looks really interesting. I’m looking forward to seeing it. Oh how fun~ what a great trip. Great interview too! I love this movie and I loved his character as well. I am so jealous that you had this opportunity to interview him. OH and my kids want to see this movie again and again. I’ve never heard of this actor before but I bet after this movie he will be everywhere! So awesome you got to meet him! I can’t wait to see this with my husband! It looks SO awesome!! Great interview! Kind of neat to hear how the audition process goes! It is a nice thing to be able to speak with the people who create the art we enjoy. That type of interaction give as a different and art and the industry.